Since today is Independence Day in the States and many of my friends and family will be enjoying celebrations, today’s blog post takes a look at fireworks used as spectacle in the Middle Ages. First invented in China during the early twelfth century, fireworks came to Western Europe by way of merchant trade routes. By the late fourteenth century, small pyrotechnic displays were being used to enhance Christian mystery plays, where the ‘whole Church was filled with sparks’. Over the next centuries, fireworks became a part of festivities at royal courts, religious dramas, and even summer markets. Drawing of ‘Fiery Dragon’ firework display c. 1658 (John White, “The School of Artificial Fire-Works,” A Rich Cabinet (1658). 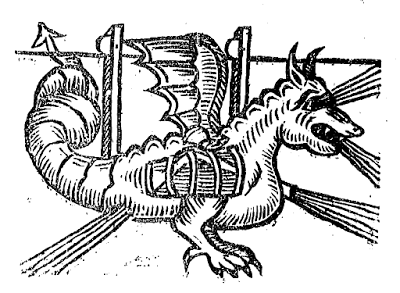 A popular firework display was the ‘fiery dragon’ that would move across the sky sending fireworks all around. Another popular type was a spinning wheel of sparks or girandola. 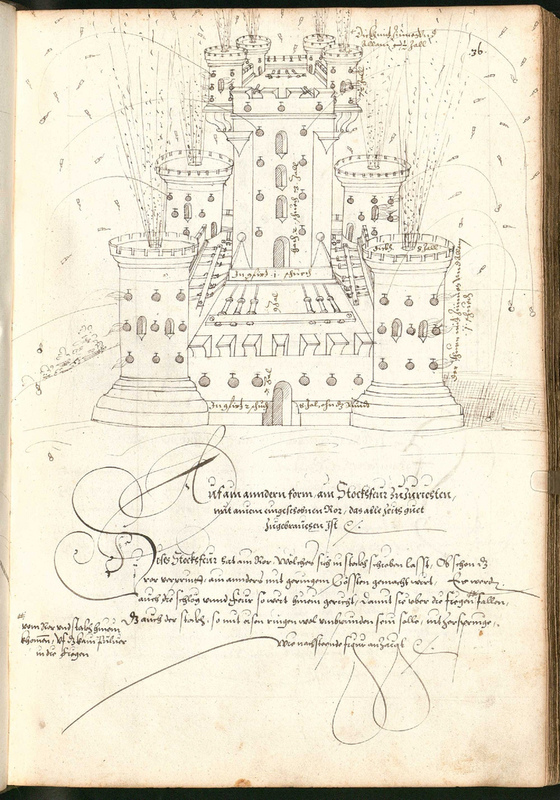 We know of these early displays from a book about fireworks from 1594 by Friedrich Meyer. 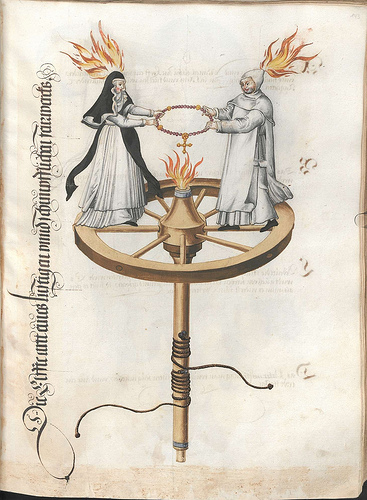 Also in this book we come across a spectacular drawing of ‘the spark of life’ theory popular in the sixteenth century. This image is connected to the idea that an essential part of fireworks corresponded to an essential part of human nature. Perhaps during the summer, the medieval person came across the opportunity to see these displays of drama and performance. Artilleriebuch by Walther Litzelmann, 1582. Or perhaps they were enjoying summer games. However, these festivites were generally over by August, when the Dog Days of Summer arrived. Usually from late July into mid-September when the rising of the dog star, Sirius, signaled the months with the hotest temperatures, and were believed to be unhealthy for many activities. Although the first sparklers may have been made from goose quills, we all enjoy summer just the same. Simon Werrett, Fireworks: Pyrotechnic Arts and Sciences in European History. (University of Chicago Press, 2010) p. 17. This post was originally inspired by a recent revelation that one of my ancestors may have lived in Leiden in the early 1600s. A particularly unexpected find — given the fact that my family is from the West Coast of Canada (over 7000 km from Leiden) — it was a surprise to find that my ‘eleventh-great-grandfather’ may have lived, literally down the street from our office here in Leiden, almost 400 years ago. 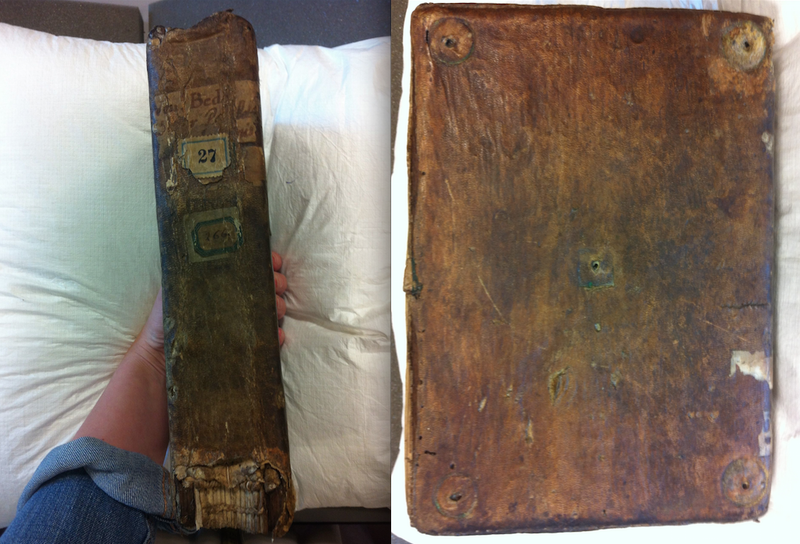 In the wake of this little discovery, I began to wonder about the history of ‘family history’. 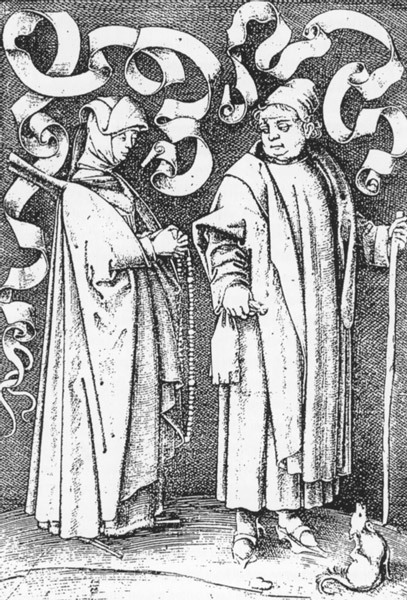 In the Middle Ages, how did people keep track of their family heritage? How important was it to know where you came from? (Or perhaps, how important was it for others to know where you came from)? 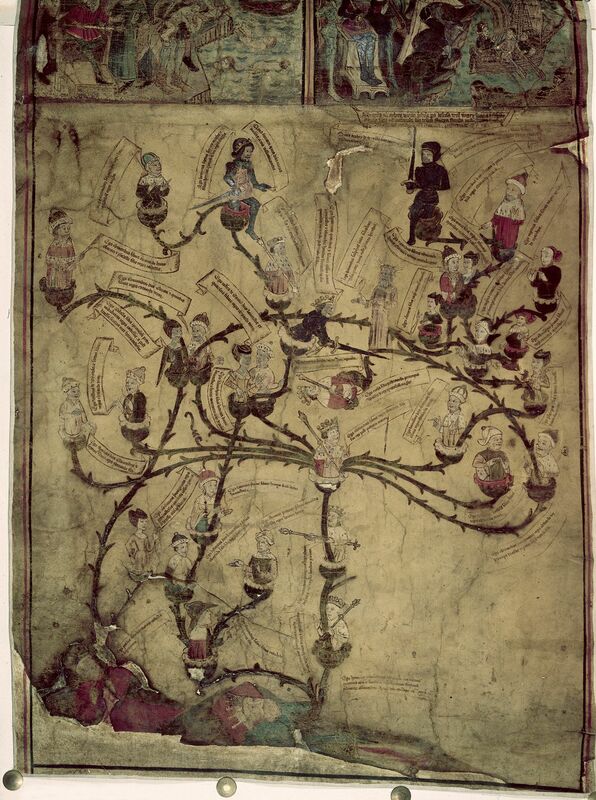 For some medieval families, the task of documenting and publicizing the ‘family tree’ was critically important. This was especially the case for royal and noble families, who were reliant on the continuation of blood-lines to maintain positions of power and prestige. 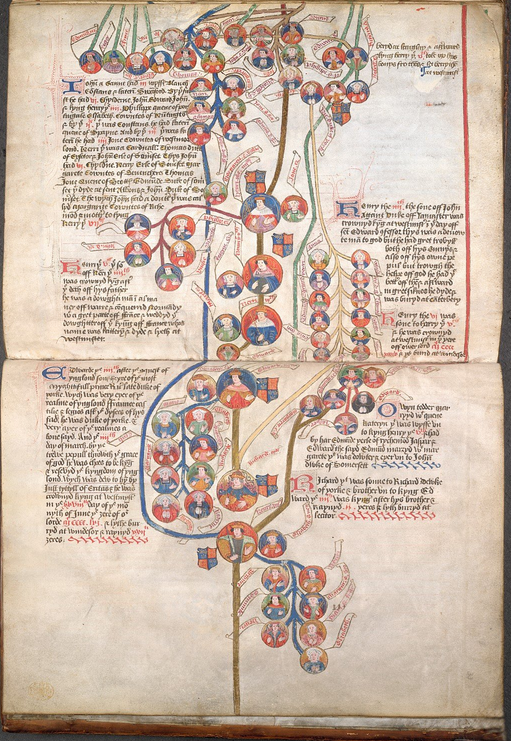 These family histories often survive in large chronicles or genealogy books, some of which include artistic representations of the family tree — each branch of the tree signifying (and confirming) various relationships. 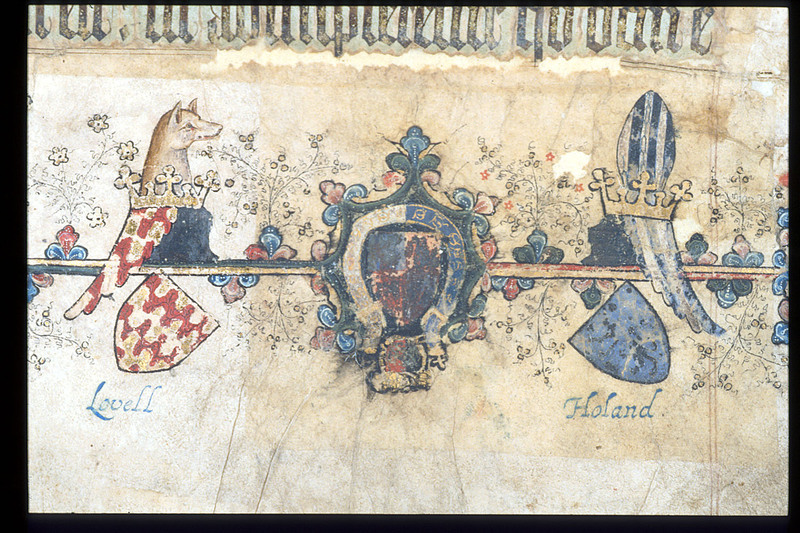 Royal families were not the only ones interested in preserving their history on the page, however. 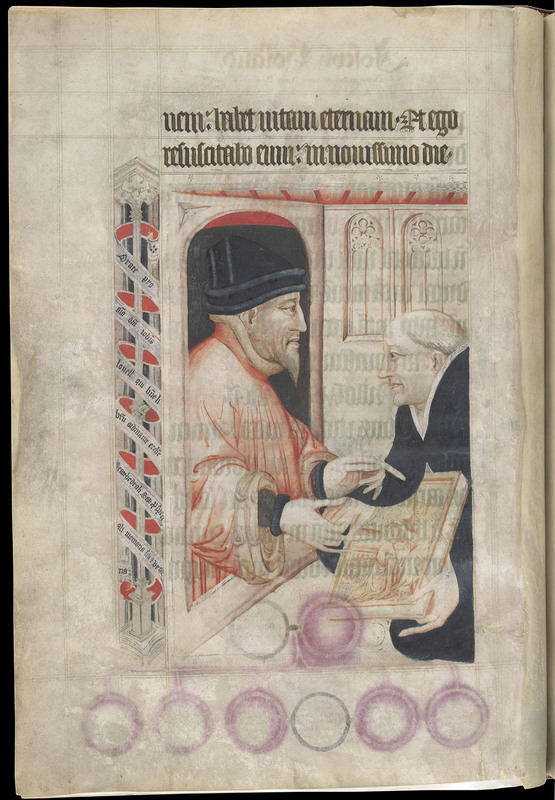 There is a nice example of an early-fifteenth-century nobleman named John Lovell, who commissioned a liturgical book to be made as a gift to Salisbury Cathedral. What is different about this lectionary book, however, is that it is riddled with Lovell family history (as well as that of his wife’s family, the ‘Holands’). Orate pro anima domini iohanis lovell qui hunc librum orinavit ecclesie cathedrali Sarum pro speciali memoria sui et uxoris. 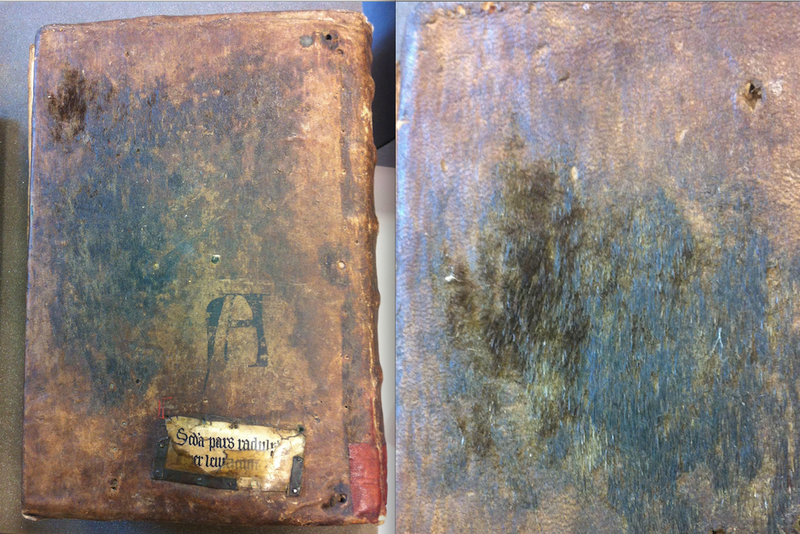 [Pray for the soul of John Lovell who gave this book to Salisbury Cathedral, on behalf of the memory of him and his wife]. 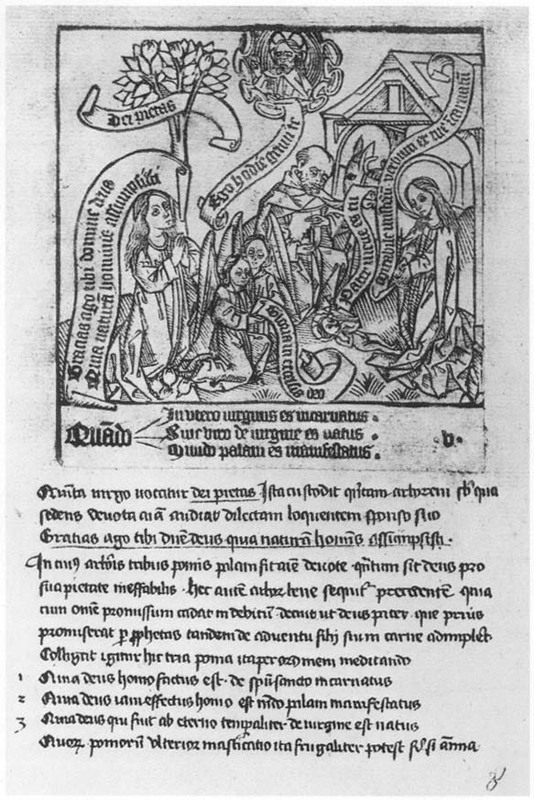 While there were a number of ways to preserve one’s family history in the Middle Ages, it seems that this was an activity pursued most regularly by wealthy and noble families — those who could afford to document their history in a manuscript book, and those whose status relied most heavily on the continuation of the family line. 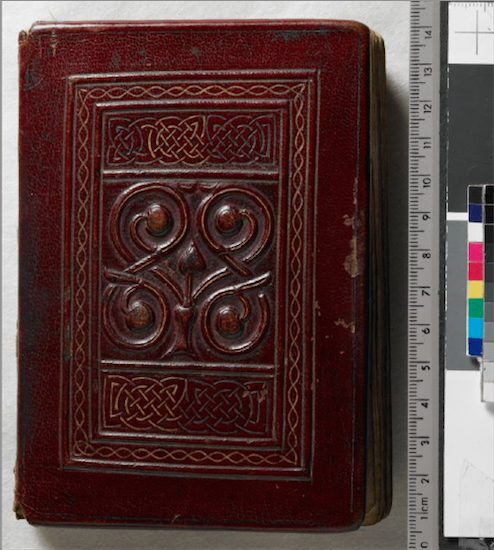 That is not to say that other medieval families were not interested in their ancestors, but simply that they did not typically have the means to formally record their history in a book or roll. 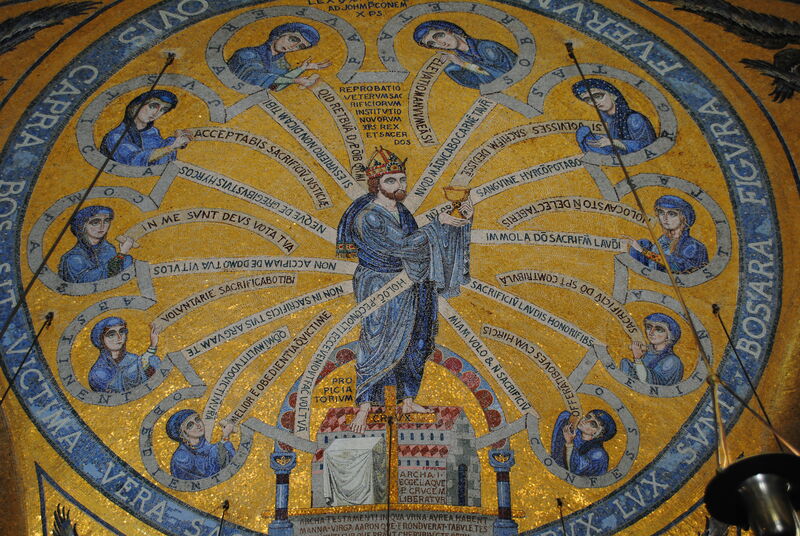 Alas, we must resign ourselves to the fact that the medieval record is dominated by royal family trees, lined with kings and queens dangling from the blossoms. 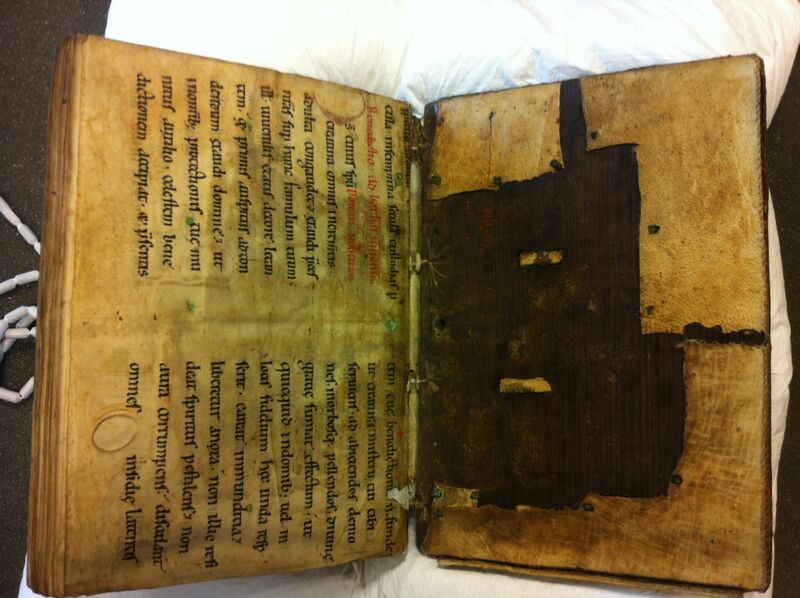 Medieval manuscripts often contain traces unintentionally left behind by the scribe. A casualty of spell-check and mass-production, mistakes in books, like typographical errors, are now usually spotted before they reach the shelves. 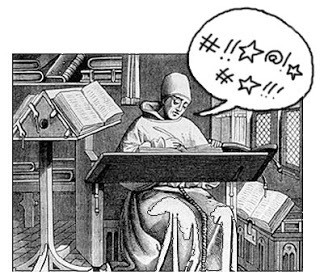 The medieval scribe wasn’t necessarily so lucky. Copying by hand was an arduous process and mistakes could creep in all too easily. Today I’d like to explore two versions of the most common accidental error made by medieval scribes, that is eyeskip. Eyeskip occurs when the scribe’s eye literally jumps from one occurrence of a word to the next while copying, and results in either the omission or repetition of words or phrases. 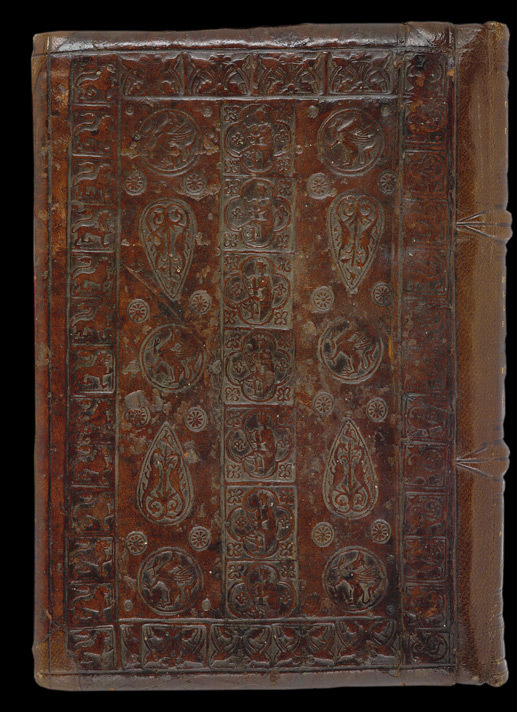 This ninth-century book produced at the palace school of the famous emperor Charlemagne is one of the treasures of Leiden’s collection – a copy of the Roman poet Lucretius’ De rerum natura (VLF 30). 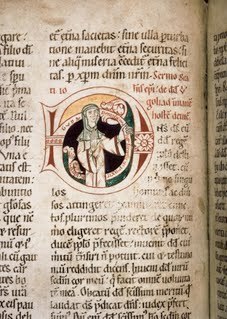 Not only is it one of the earliest medieval copies of the text, but it has been corrected by a scribe whose identity we know – the Irish monk Dungal. 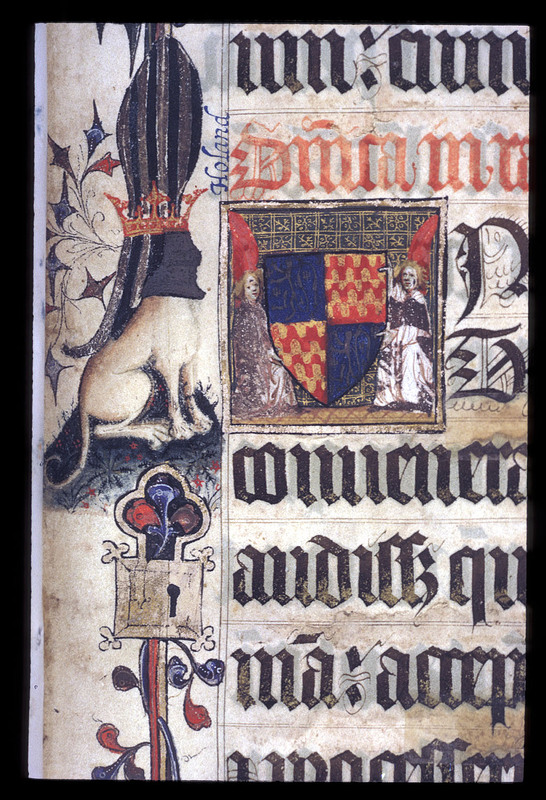 We can see Dungal at work on this page (f. 22r). The change in hand is clearly visible and, moreover, the correction has a sort of squashed aspect. That’s because Dungal has replaced one line of poetry with two – adding something that the original scribe had missed. 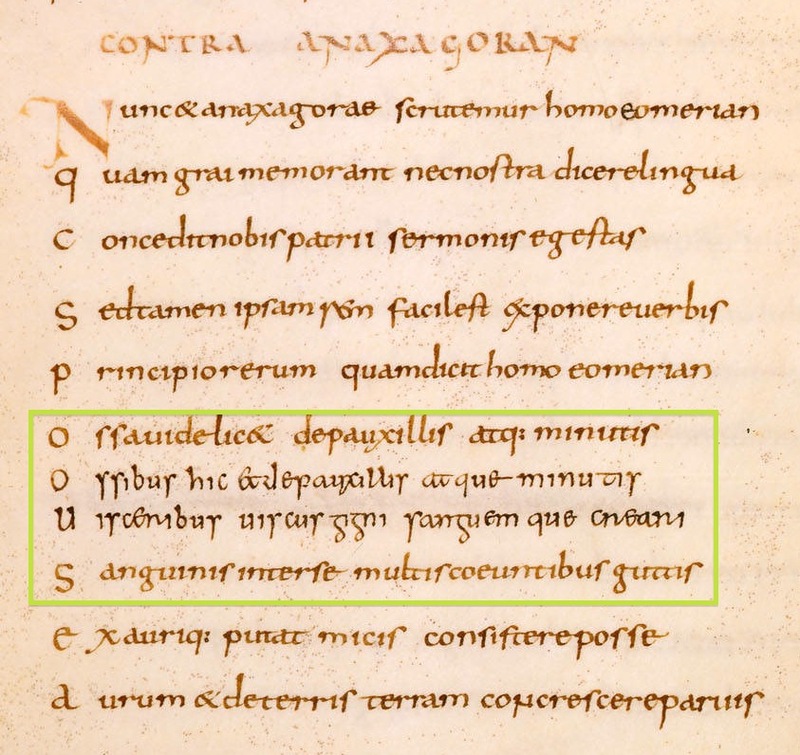 If we look at the text of the four lines highlighted above, we can see that lines 1 and 2 are quite similar – both end in ‘pauxillis atque minutis’. 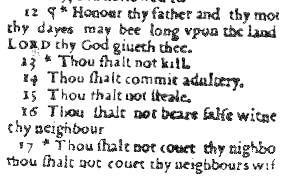 Reconstructing the mistake, it’s likely that the scribe omitted line 2, proceeding straight to line 3. The technical name for the omission of text due to the scribe’s eye skipping from one occurrence of a phrase to the next is haplography. As we can see Dungal rectified the error by scraping out the misplaced line, then replacing it with the necessary two lines of correct text. Eyeskip could result in omission, as demonstrated, but could also result in repetition of text. 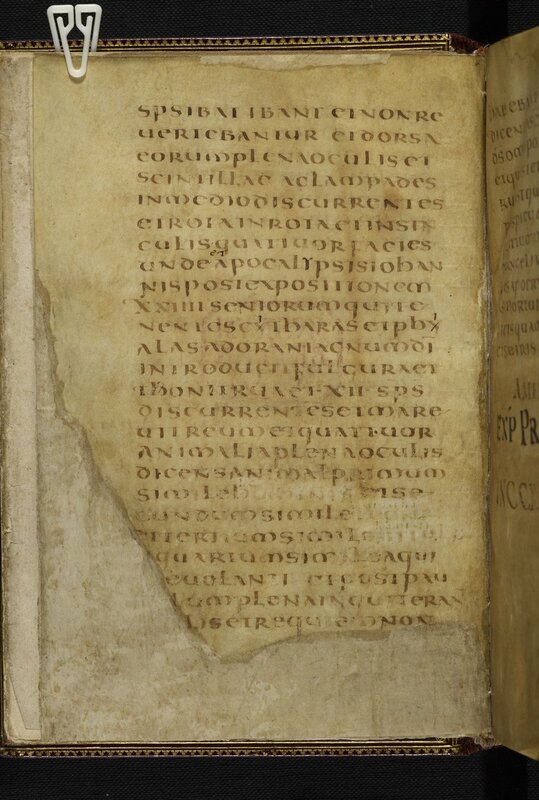 This manuscript, the Scholiasta Gronovianus (VLQ 130), a tenth-century copy of a collection of commentaries on Cicero’s speeches, contains an example of this type, an error termed dittography. As we can see, it was noticed by a later reader, who boxed the duplicated line half-way down the page. Here the problem seems to have been provoked by the recurrence of the word quomodo (as indicated). Rather than moving on to ‘quomodo dixit‘, the scribe’s eye jumped back to the preceding sentence and repeated the line beginning ‘quomodo facit‘. 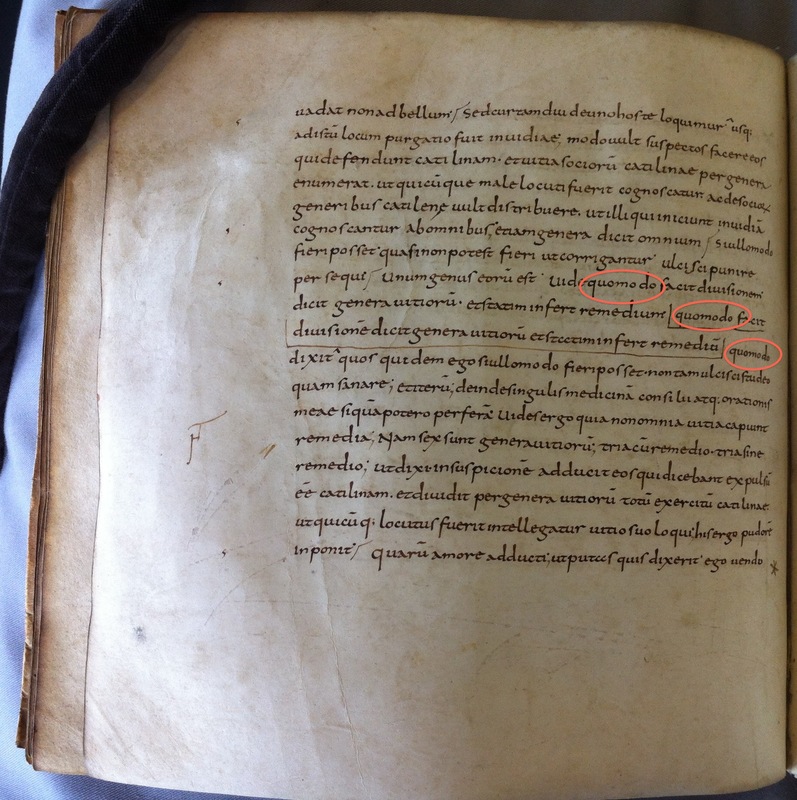 It’s interesting to note that word-separation is not standardised in this manuscript; its probable that the exemplar from which the scribe was copying was not standardised either, which may have made mistakes of this type even more easy to make. Mistakes resulting from eyeskip tell us something about the process and pitfalls of copying by hand, and the role of the later corrector/reader. In some cases, we may even find a group of manuscripts where the same accidental error is copied from one to another, allowing us to establish textual relationships between manuscripts, useful for understanding the history of the transmission of a text. So medieval errors, even when corrected, provide a genuine opportunity to learn from mistakes! Ramona Venema works as a research assistant in the Turning Over a New Leaf project. She maintains her own cookery blog. Today, a world without punctuation seems impossible. How could we survive without the Oxford comma? 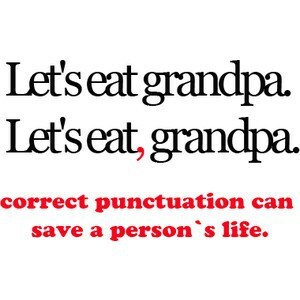 We rely on punctuation as a critical means to clarify our language and make sure we are understood. In the case of English, the use and placement of punctuation can easily change the meaning of a sentence (just as the famous internet meme shown above demonstrates). In many ways, the saying “dotting your i’s and crossing your t’s” should be replaced with “check your commas and apostrophes”. In the Middle Ages, however, people used punctuation differently (and apparently they were not as worried about eating their grandfathers)! In the West, the development of punctuation has been credited to early Irish and Anglo-Saxon scribes, who were not initially familiar with reading Latin texts. To add extra “support” for their contemporaries reading in a foreign language, they began to add punctuation to the texts they copied. However, the marks used at this point were quite different than today. Whereas modern punctuation marks tend to clarify syntactical functions in a sentence, during the early Middle Ages it was primarily an aid for reading out loud (helping the reader to know when to elevate his voice or pose a question, for example). As individuals began to read silently rather than orally, and Latin was learned through grammar books, punctuation became even more of a necessity. Eventually punctuation became “trendy” — just like those who stand in line at the Apple store when the new iPhone comes out, scribes were “standing in line” to try punctuation out themselves (albeit with a couple of pointers from Isidore). By the seventh and eighth centuries every Brother Pete and John was using their own set of specialized punctuation marks. Alright, it was not always that personal, but (pre-Caroline) minuscule scripts, Visigothic and Beneventan script all presented a unique set of punctuation marks at least, with individual scribes adjusting some features as they saw fit. The way in which punctuation was applied to the text, could, in turn, customize the text itself. We owe this discovery to Malcolm B. Parkes, who, in his well-known history of punctuation, Pause and Effect, describes how a particular sentence can be explained differently through the varied use of punctuation. Although there was a lot of variation in punctuation, there are few general marks common to many script-types. One of the most fundamental and most common marks is the punctus, which functioned much like the modern comma, semicolon and period. It could be fat or small and could be placed at the baseline, the middle or the headline. In simpler terms, the punctus is a dot which can take on a variety of functions and sit wherever it wants to. The punctus elevatus is not simply a ‘snobby punctus’ (as one may assume from its name) but an inverted semi-colon, acting as, you guessed it, a semi-colon! This punctuation mark was most common from the twelfth to the fifteenth centuries. At the end of the fifteenth century the semi-colon, as we know it today, seems to have taken over. Lastly, the question mark, also known in Latin as the punctus interrogativus. This elusive mark took on many shapes, from a “lightning flash” (Truss), to “a squiggle above a period” (Reimer). It was, unsurprisingly, used to indicate the end of a question, alerting the reader to adjust the tone of his voice. The syntax of a sentence would usually indicate to the reader whether they were dealing with a question, and for this reason, they were often considered redundant additions to the page. This is why I get excited every time I see one in a manuscript, which isn’t really that often (although I have other paleographical features to get excited about as well, so don’t worry)! Of course, there are many other punctuation marks and variations of those marks to be discovered. I suggest consulting some of the sources listed below if you’ve become curious about the punctus and his many friends. Parkes, M. B. Pause and Effect: An Introduction to the History of Punctuation in the West. Berkeley: U of California, 1993. Powell, James M. Medieval Studies: An Introduction. Syracuse, NY: Syracuse UP, 1976. Reimer, Stephen R. “Manuscript Studies: Paleography: Punctuation.” Manuscript Studies: Paleography: Punctuation. University of Alberta, 20 June 2009. Web. 23 May 2014. <http://www.ualberta.ca/~sreimer/ms-course/course/punc.htm&gt;. Tillotson, Dianne. “Punctuation.” Medieval Writing. Dr Dianne Tillotson, 29 Feb. 2005. Web. 23 May 2014. <http://medievalwriting.50megs.com/scripts/punctuation/punctuation2.htm&gt;. Truss, Lynn. Eats, Shoots & Leaves: The Zero Tolerance Approach to Punctuation. New York: Gotham Books, 2003. 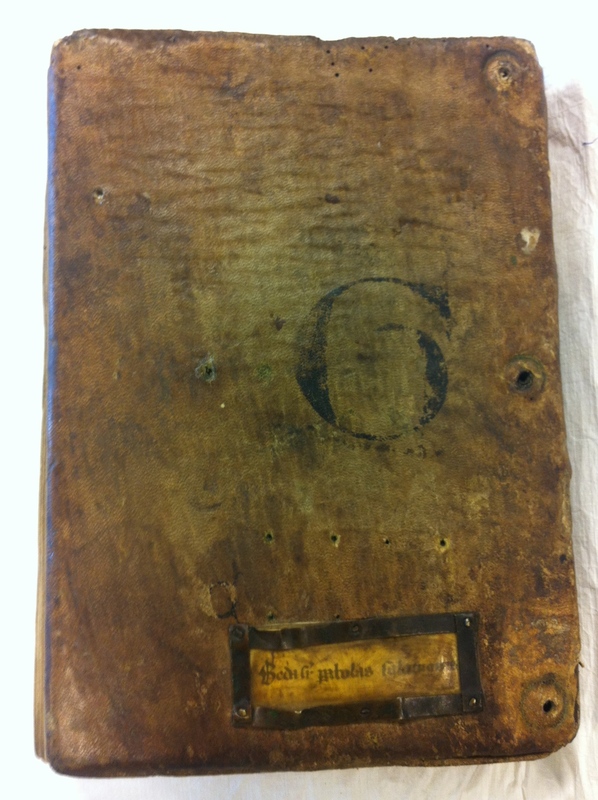 Here at the Turning Over a New Leaf project, we tend to focus our attention on the medieval ‘codex’ — texts hand-written on parchment, folded and sewn into quires, then wrapped together in a binding. The codex, however, was not the only vehicle of the medieval text. Long before this format came into popular use in the first and second century AD, the ‘scroll’ was the preferred packaging for a written text. 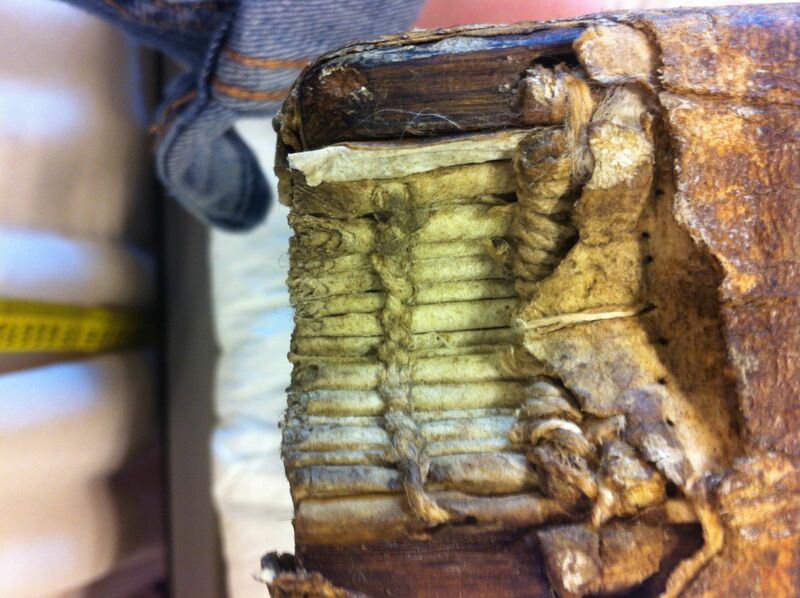 Today’s blogpost is devoted to everything you need to know about the medieval scroll. How was it put together? What was it made out of? What were they used for? 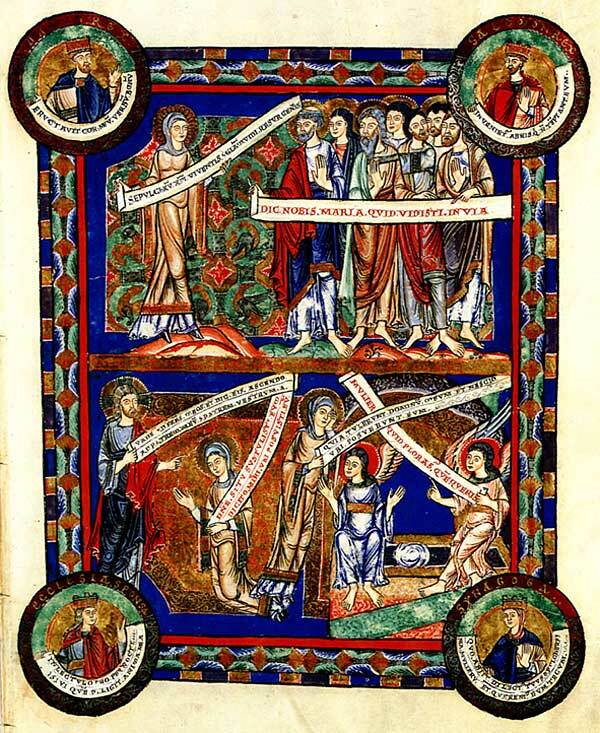 Is there a future for the medieval scroll? To make a scroll, one first needs to choose the material. Some of the oldest scrolls were made of papyrus, and despite the fragile nature of this material, there are many papyrus-scrolls that still survive. 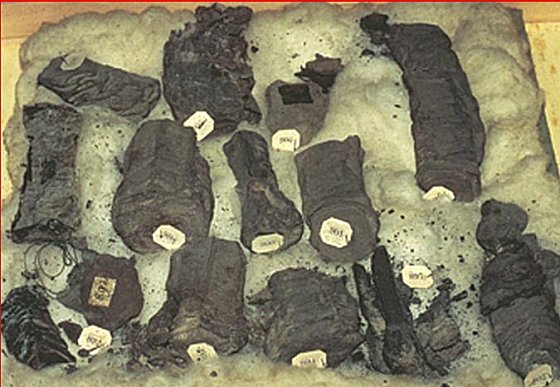 Carbonized papyri scrolls from Herculaneum. During the Middle Ages, parchment became the material of choice, which was then eventually replaced by paper in the early modern period. 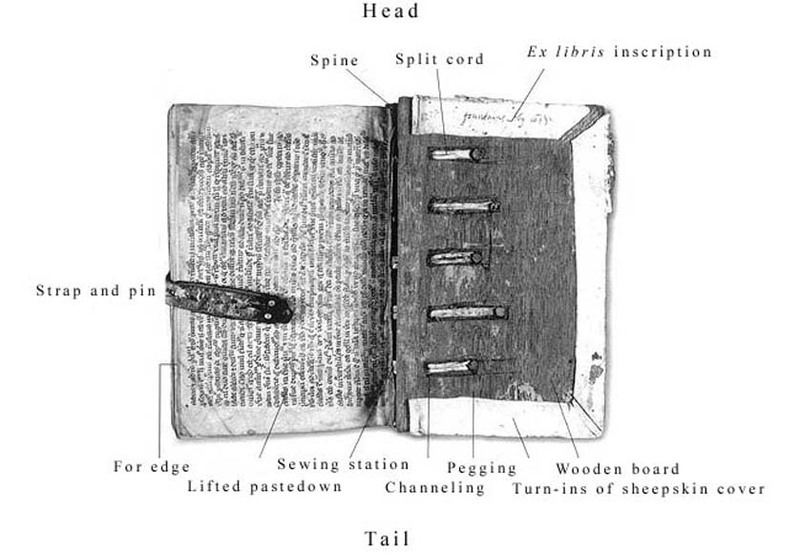 Once the material was chosen, the scribe then copied the text onto separate sheets, which were then glued or sewn together, one after the other. 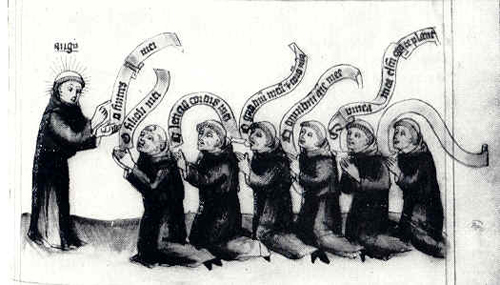 In some cases the scroll was meant to be read from left to right (thus the reader needed to unfurl it sideways), while in other cases it was meant to be read from top to bottom. 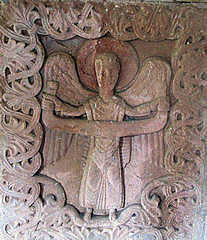 As soon as the codex was invented in the first century AD, it threatened the survival of the scroll. The codex was more sturdy and it was easier to find passages of text (flipping pages to find a chapter is a lot easier than unfurling a giant scroll). 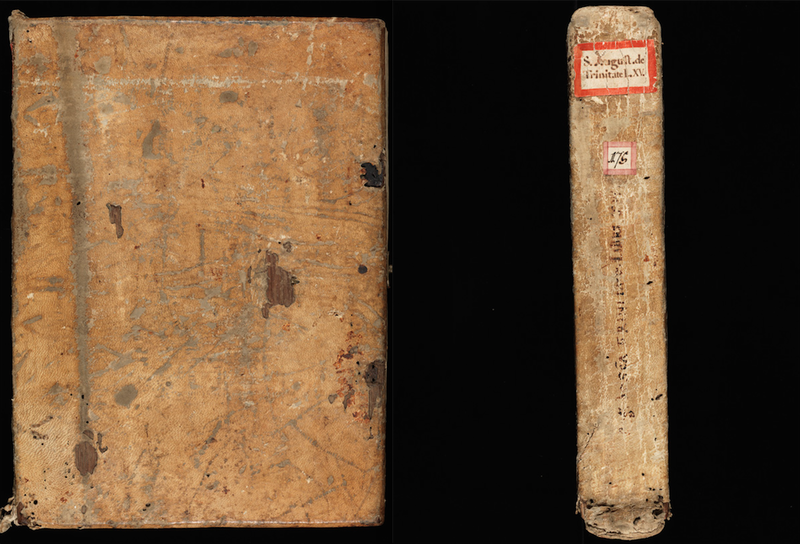 The birth of the codex did not mean the death of the scroll, however. 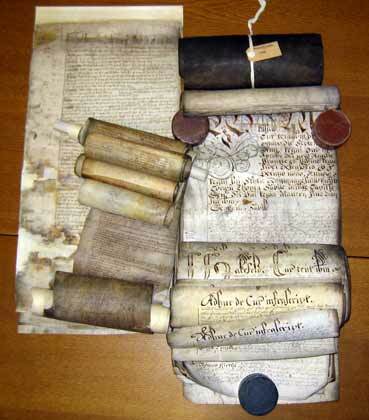 Scrolls continued to be used in various contexts, and were particularly favoured by long-term record-keepers. 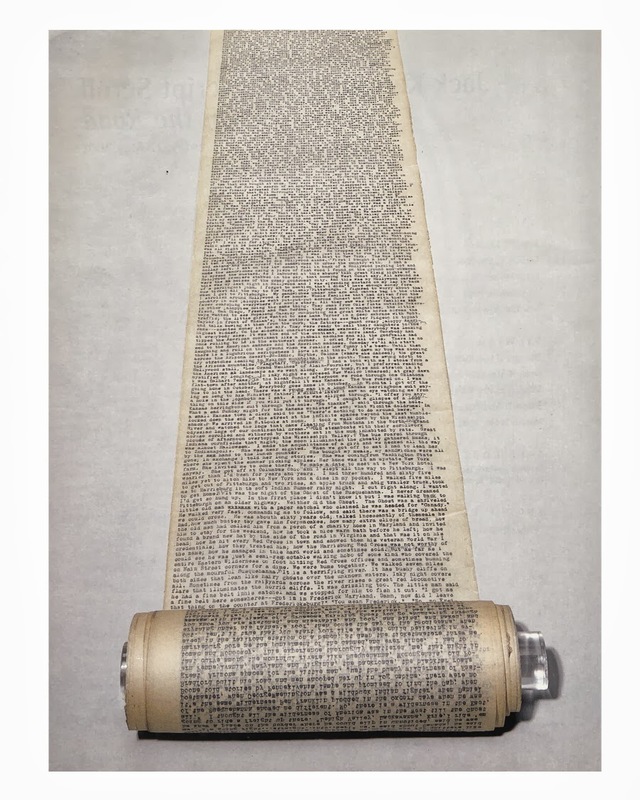 One of the biggest advantages of the scroll was the fact that pages could be easily added — all one needs to do is glue another sheet to the bottom! 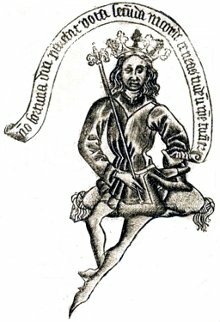 This logistical benefit was not lost on some medieval government agencies, such as the English Exchequer, which kept most of their financial records throughout the Middle Ages in scroll form, known today as Pipe Rolls. Winchester Pipe Rolls (More information click here). It was not only the government that saw a benefit in using scrolls. 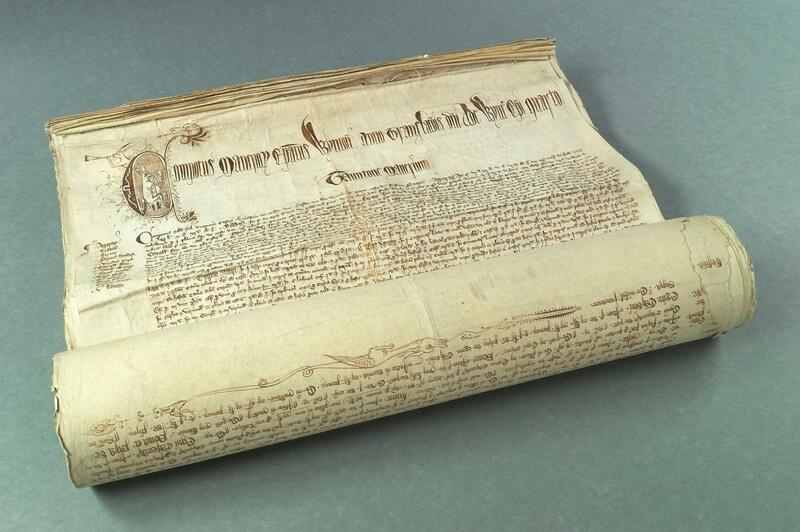 The records of Wakefield Manor, one of England’s largest manorial houses, were kept up-to-date in a collection of scrolls from the years 1274 to 1925! 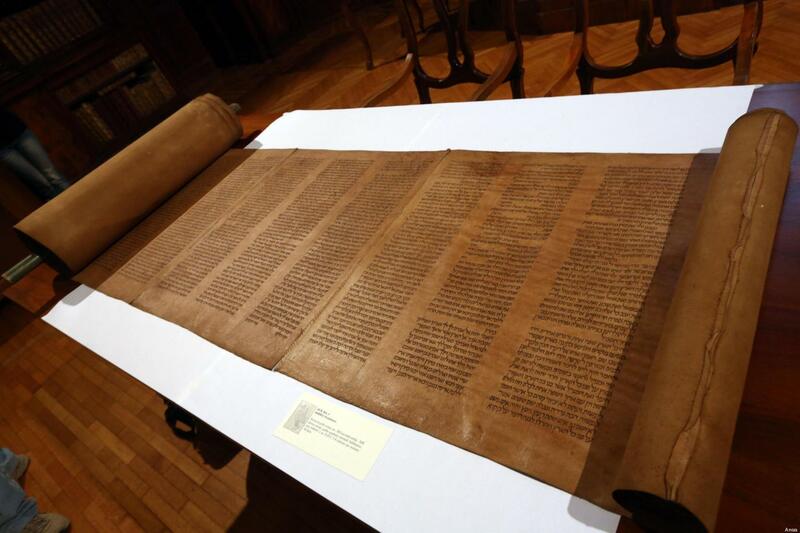 One of the most recognizable scrolls still used today is the Torah — a text comprised of the first five books of the Hebrew Bible, which is copied onto a scroll, and read out to Jewish communities at least once every three days. It is typically forbidden in Judaic custom to touch the Torah with bare hands, both in reverence to the Word of God and to avoid damaging the text on the page. 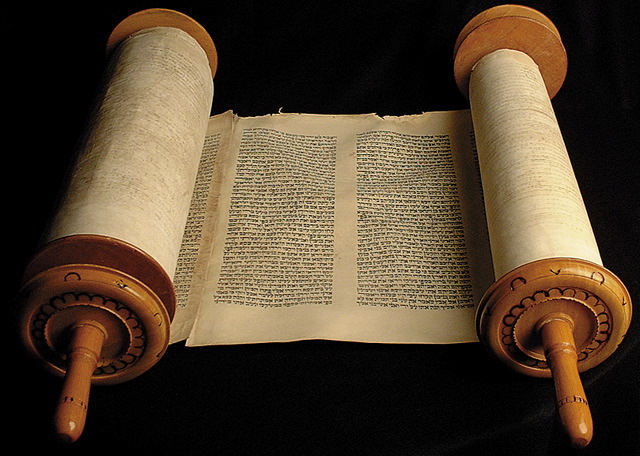 To avoid touching the scroll, the Torah is commonly equipped with specialized wooden handles. 4. The Future of the Scroll is Bright!